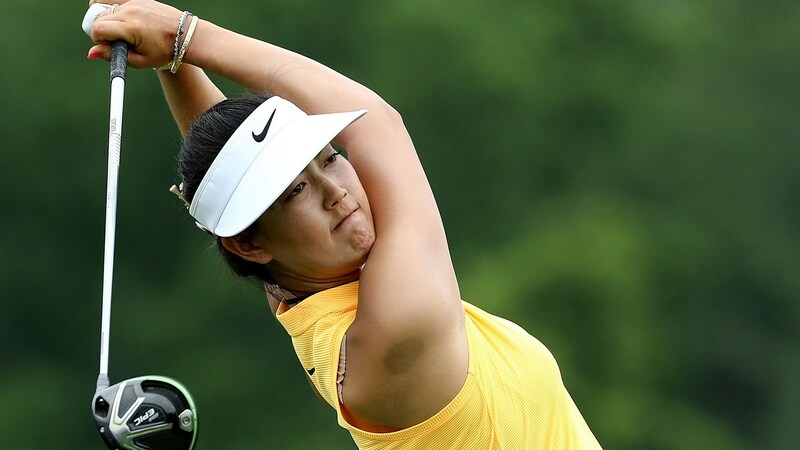 BEDMINSTER, N.J. – Michelle Wie was ready to withdraw from the U.S. Women’s Open after a painful neck spasm flared as she prepared to return from a two-hour weather delay in Thursday’s first round. By round’s end, she was giddy about giving herself a chance to play the weekend. Wie posted a 1-over-par 73. She was 3 over on the front nine before the weather delay, fought back with a pair of birdies, and then had to sit out for the long rain delay. When she was warming up on the range to return to play the final five holes, she aggravated her neck. Wie said she couldn’t make a full turn playing those final five holes, but she played them in even par with a birdie at the last. Wie said she teed it up Thursday without having hit a full shot since the KPMG Women’s PGA. Wie said she had an MRI before the U.S. Women’s Open that showed no disk problems. “It’s just a neck sprain,” she said. Wie didn’t practice all last week and didn’t play a practice round after arriving Sunday at Trump National. She chipped and putted in the practice area on Monday and Tuesday and walked the back nine Wednesday, limiting herself to chipping and putting again. With her fellow competitors Brittany Lincicome and Suzann Pettersen ready to go after Thursday’s weather delay, Wie was allowed extra time to loosen up. Her father, B.J., massaged her neck to get her ready before she hit her tee shot into the 14th, a 179-yard par 3. She hit the green and made par, and the physio team helped her the rest of the way.